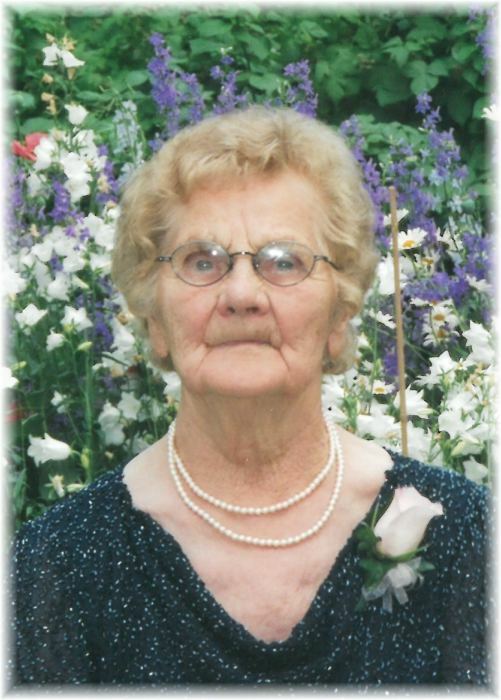 It is with great sadness that we announce the passing of our mother, grandmother and great grandmother, MARY KUZYK on July 18, 2018 at Grandview, Manitoba. She leaves to cherish her memory: daughter Theresa Boguski of Roblin, MB; sons David (Larissa) of Dauphin, MB, Robert (Dolly) of Winnipeg; Richard (Valerie) of Winnipeg, MB and Lesley (Angie) of Dauphin, MB. Ten grandchildren, Jennifer (Marc) St. Laurent, Jaime (Jeremy) Angus, Raymond (Kristin) Kuzyk, James Kuzyk, Justin (Samantha) Kuzyk, Christopher (Jenna) Kuzyk, Vincent (Erica) Kuzyk, Alexandra Kuzyk and Samantha and Lauryn Kuzyk. Six great-grandchildren Luc and Mila St. Laurent, Elena and Kenzie Angus, Aubrey and Peyton Kuzyk. She is also survived by her sister Nellie Olynick of Dauphin, MB and sister-in-law Rose Brykaliuk of Brandon, MB. Mom was predeceased by her husband Peter (1984), son Peter (2015), son-in-law Don Boguski (2015) and five children in infancy, her brothers Mike, Stan, Ed, Nick and Bill and John Obedniak. Mary and her twin brother Mike were born on April 10, 1920 at Glen Elmo, MB to Dora and William Brykaliuk. She attended a country school at Mears, MB, then at Glen Elmo, MB. Mary married Peter Kuzyk on November 21, 1943. Together they farmed for many years with Mom tending to the many chores such as milking the cows and feeding the turkeys, geese, and chickens. Mom was very interested in the operation of the family farm and was so happy to see her sons, David and Lesley continue with the upkeep after her husband’s passing in 1984. Gardening was also a very important part of her life. She grew and harvested a multitude of vegetables which she transformed into delicious meals to nourish her family. Her baking and preserving skills were outstanding, especially her special cakes, pies and jelly rolls. Mary was devoted to her Catholic faith. She was quite proud to be a member of the Ukrainian Catholic Women’s League and received a pin of recognition for 50 years of service. Mary so enjoyed her Ukrainian heritage. She would never miss the parade, the grandstand show and other festivities at the Dauphin Ukrainian Festival. She was so proud of Samantha, Lauryn and Alexandra when they participated in Ukrainian dancing. Mary was well known for her traditional goodies. No one could top her borscht or beautifully decorated Paskas. With friends, Mom was able to travel on bus tours to the Black Hills, S.D., Vancouver, BC, Niagara Falls, Ontario and the Mineral Hot Springs at Watrous, SK. She very much enjoyed going on day trips with her dear friends Stella and Marion. Her favourite past-times were playing Bingo at G.A.C.C.., trying to win the “Big One” through Lotto 649 and Set for Life scratch tickets. Knitting and crocheting afghans and mittens were also her favourite things to do and of course watching the Dr. Oz television show. Mary was an independent lady. Mary was able to reside in her own home just short of her 98th birthday. She absolutely loved her home-care workers and looked forward to their visits with her. Christmas Day Supper at Baba’s was certainly the highlight of the Christmas Season. Baba was so happy to see all her family come to her home and join her for supper. These memories will always be cherished. Her friendly kind hearted nature was admired by all who knew her. She managed to continually remain positive and encouraged others to be kind to one another and forgive. She was always interested in what her children and grandchildren were doing and so proud of all their accomplishments. Special thank you to Dr. Elliot, Dr. Rae and all the nursing staff at the Grandview Hospital, and Dr. Penrose at the Dauphin Hospital for their excellent care for our mother.